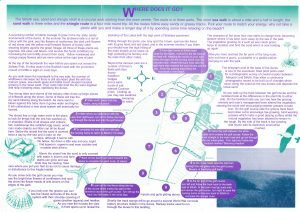 The Silloth sea, sand and shingle stroll is a circular walk starting from the town centre. The route is in three parts. The short sea walk is about a mile and a half in length, the sand walk is three miles and the shingle route is a four mile round trip. All the routes follow easy sandy or grassy tracks. Pick your route to match your energy: why not take a picnic with you and make a longer day of it by spending some time on the beach? A surprising number of plants manage to grow in the dry, salty, sandy environment of the dunes. In the summer the landward side is a riot of colour with the pink, pea like flowers of restharrow, the dark pink flowers of red clover and the yellow multi-headed flowers of kidney vetch showing brightly against the green foliage. All three of these plants are legumes, like peas and beans, and survive the harsh conditions by increasing the soil fertility around their roots. Yellow hawkweed and orange poppy flowers add yet more colour at the right time of year. At the top of the boardwalk the view before you opens out across the Solway Firth, 8 miles away is the Scottish coast with the prominent mound of Criffel in sight on most days. As you walk down the boardwalk to the sea side, the number of wildflowers decrease but there is still abundant plant life with the marram grass, sea couch grass and bottle brush shaped horsetail growing in the loose sand. Their roots help bind the dry sand together and stop it blowing away, stabilising the dunes. The strong tides and storms of the estuary often throw up large pieces of driftwood along the shore. Some of these will trap the dry sand blowing along the beach. As more sand is blown against this baby dune it grows wider and higher. If left undisturbed a new dune system will eventually be formed. The strand line or high water mark is the place to look for things the beach has washed up, or stranded. Shells of all shapes and colours, fish, bubblewrap-like cuttlefish egg cases, wood, man made objects and litter can all be found here. Below the strand line the sand is covered twice a day by the sea and is bare on the surface, although it teems with life below. Go down a little way and you might find lugworm, ragworm and even cockles and mussels alive alive-o. Above the strand line the sand is only covered with water in storms and here plants can grow and sea birds may be nesting. Take care where you put your feet so as not to cause damage or disturbance to this fragile habitat. As you come onto the golf course you may see the bright blue flowers of cornflowers and spot the chive like flower heads of wild onions on the edges of the path. If you look over the greens you can see the inland remnants of the dune system with their shrubby covering of gorse (another legume) and heather. As you near the houses, the view in front of you opens up to reveal the backdrop of the Lakes with the high point of Skiddaw prominent. Flitting through the gorse, you may spot the brown, sparrow like linnet with its grey head and red chest, and in the summer months if you listen you should hear the high trilling of the male skylark as he soars up high protecting his territory and his mate from other males. Beyond the caravan park are a number of farmer’s fields with their thorny hawthorn hedges and a windbreak of salt tolerant Corsican pines. Looking up you may see swallows swooping to catch insects and gulls gliding above. Shortly, the track swings left to go around a Second World War concrete battery structure hidden in the dunes. Railway tracks used to run through the dunes to this building. The character of the dune face now starts to change here, becoming steeper where it has been worn away by the sea in the past. The vegetation growing on it is such as sea couch grass helps to stabilise and bind the sand which is now building up again. Now you have reached the far point of the long route, why not have a picnic, a sunbathe or a paddle before carrying on the walk. The telegraph post at the base of the dunes is one of seventeen fixed point posts used for a photographic survey of coastal erosion between Maryport and Silloth. They allow a continuous photographic record to be built up of changes which occur along the coast as the sea erode and deposits the loose sand. As you walk up the track between the golf course and the farmland look at the differences in the plant life to either side. On the farmland side you can see how the grazing animals and man’s management have altered the vegetation, clearing the scrub and encouraging sweeter grasses to take over. On the golf course side the greens have been kept close cut to encourage low growing, hard wearing grasses which make a good playing surface whilst the natural vegetation has been allowed to remain in the rough. By the side of the track is low growing wild thyme with its distinctive smell when crushed. To download a pdf copy of the leaflet, click on the link below.